Suffolk County Crime Stoppers and Suffolk County Police Second Squad detectives are seeking the public’s help to identify and locate the people responsible for burglarizing a residence in Melville. Melville, NY - January 29th, 2015 - Suffolk County Crime Stoppers and Suffolk County Police Second Squad detectives are seeking the public’s help to identify and locate the people responsible for burglarizing a residence in Melville. 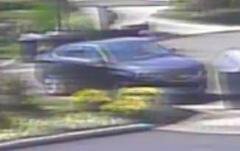 A male and female entered a residence on Lattice Court on June 24, 2014 at approximately 10:45 a.m. The two stole proceeds from the home including jewelry, handbags and an iPad. The two fled in a black 2014 Chevrolet Impala with a rear white license plate, unknown state, and no front license plate. Subject: LongIsland.com - Your Name sent you Article details of "Duo Wanted for Burglarizing Melville Home"